Last Wednesday, Dr. Steven B. Shubert gave an intriguing talk on Egyptianising elements in the famous second century BC ‘Nilotic Mosaic’ at a lecture event hosted by the Toronto Chapter of the SSEA. Speakers for their summer programme this year have explored sites not as well-known outside of academic circles. The final talk of this series took the audience across the Mediterranean to the Italian site of Palestrina (ancient Praeneste). A longtime member of the SSEA, Dr. Shubert has lectured on various topics to our local audience in past years. He holds a PhD in Library and Information Science from the University of Toronto as well as a second doctorate from the same university in Egyptology. His lecture contextualized the Nilotic Mosaic within the Greek and Roman perceptions of Egypt and contained many of his own interpretations of some of the mosaic’s scenes, which are still poorly understood. In the first part of his lecture, Dr. Shubert traced the early investigations of the mosaic. While the mosaic has been known to modern scholars since the early sixteenth century, it was long believed that it was part of the temple to Fortuna Primagenia, a Roman deity with some connections to Isis. However, during the Second World War, bombing raids destroyed the buildings on top of the temple and later restoration work revealed the actual extent of the complex for the first time. 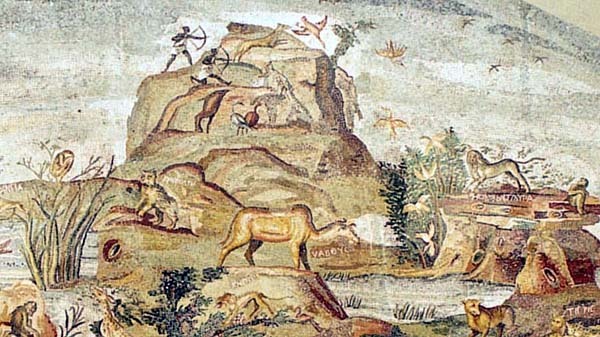 Scholars discovered that the mosaic was actually located outside the temple enclosure in a nearby grotto. The grotto naturally filled with water in ancient times, partially submerging the Nile Mosaic and its counterpart, a fish mosaic, for most of the year. There are also various interpretations regarding the modern reconstruction of the mosaic. In the 1620s, the mosaic in its original form was removed from the grotto and its current restoration (probably a metre smaller than the original mosaic) does not agree entirely with watercolours paintings commissioned of the mosaic in the seventeenth century (and now housed in Windsor Castle in England). 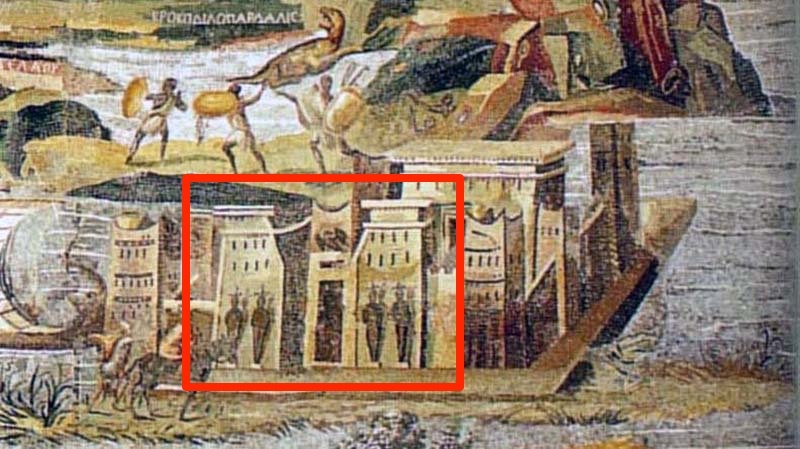 Dr. Shubert highlighted the Egyptian temple at one side of the mosaic, albeit portrayed with some charmingly inaccurate details. The temple featured the standard pylon temple entrance, and the speaker drew comparisons with Medinet Habu and the Temple of Horus at Edfu. He discussed the mummiform statues shown flanking the temple’s gateway – locations normally reserved for the flag poles as the symbol of Egyptian deities. Within this Nile Mosaic scene are also shown some guard towers and crenelations, which would have been part of some original temple enclosure walls (such as seems to be the case for Ramesses III’s mortuary temple at Medinet Habu). The mosaic contains scenes that reveal parts of Egypt and its southern neighbours within the scope of the Roman imagination of the second century BC. By this point, Egypt had been under the command of the Ptolemies for more than a century and Greeks had resided in Egypt, in particular the Nile Delta, since the late eighth century. And of course Herodotus, who may have travelled through various parts of Egypt, had communicated his wonders about the pharaonic lands through his monumental work The Histories, a work with which the Roman elite surely must have been familiar. 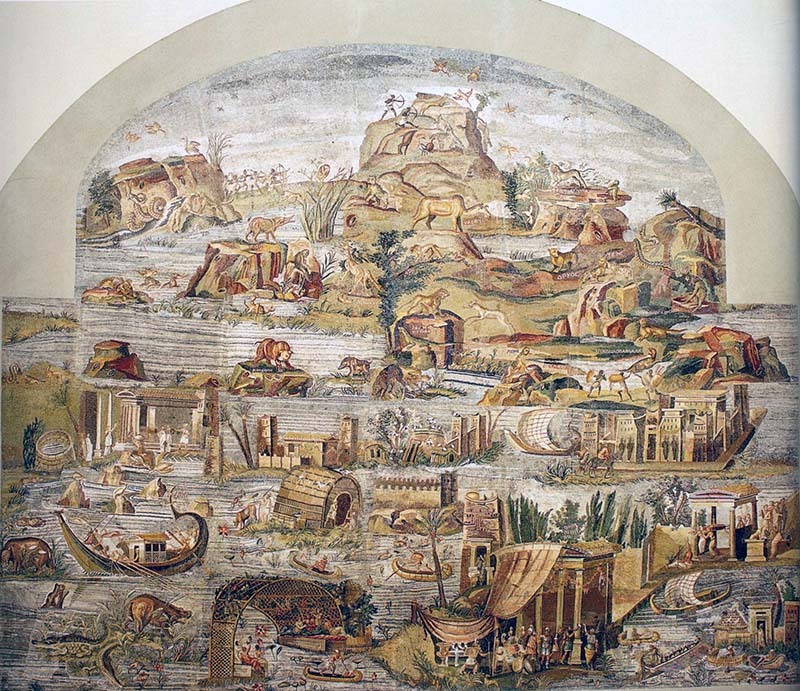 The inundated Nile is the most prominent element of the mosaic and Dr. Shubert explored the different viewpoints in the geographic arrangement of reading the mosaic. 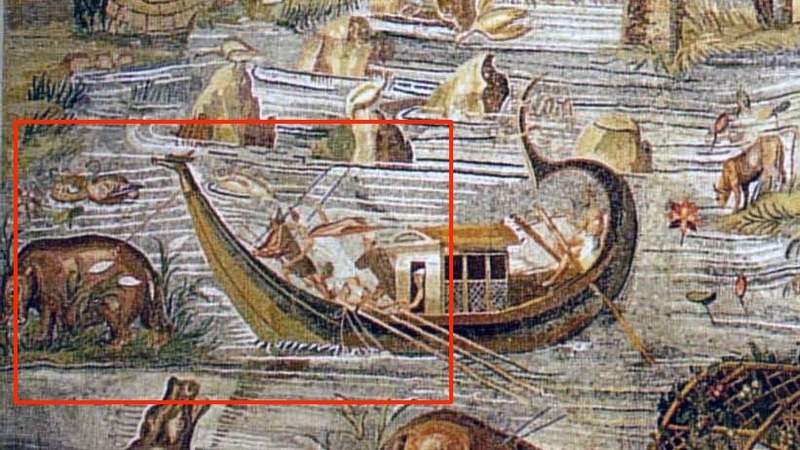 Some see Alexandria and the river’s opening into the Mediterranean as the bottom right scene in the mosaic, while at the top the viewer would find themselves looking at the landscape of ancient Aethiopia (the Greco-Roman name for areas south of Egypt). Other scenes include a hippopotamus hunt, which has a long history in Egyptian art, and a hunting party armed with bows and shields. The speaker drew a nice distinction throughout his talk between the wild landscape of Aethiopia and the wet landscape of Egypt’s Delta. Images after B. Andrae, Antike Bildmosaiken, Mainz: Philipp von Zabern, 2003, page 78.